Year after year, Barclaycard presents British Summer Time Hyde Park brings the greatest artists to the stage in Hyde Park. 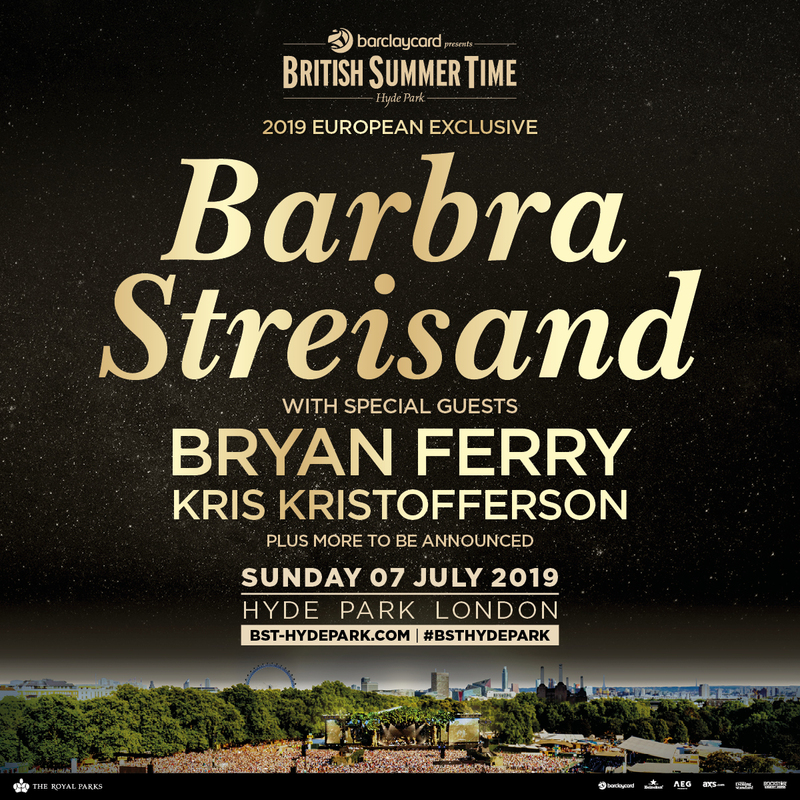 This year, a true icon, pioneer and one of the most important artists of the last half-century will make her BST Hyde Park debut – Barbra Streisand. As a European exclusive, she will be sharing songs old and new for her first concert in this country for 6 years. Joining Barbra Streisand at this incredibly special show are two legends in their own right: Bryan Ferry and Kris Kristofferson. The frontman for one of Britain’s most influential bands, Roxy Music, brought Bryan Ferry prominence as one of Britain’s most distinctive music artists, but also carved out a hugely successful solo career that continues in typically sophisticated manner to this day. This weekend, he reunited with his Roxy Music bandmates to perform at their induction into the Rock And Roll Hall Of Fame. At Hyde Park, he will be armed with iconic solo hits ‘Let’s Stick Together’ and ‘Slave To Love’, as well as Roxy classics ‘Ladytron’, ‘Avalon’ and ‘Love Is The Drug’, along with that one-off voice. Kris Kristofferson is a country musician with an unbelievable history; he excelled at Oxford University and in the US Army before pursuing his passion as a songwriter. His songs ‘Me and Bobby McGee’, ‘Help Me Make It Through the Night’ and ‘Sunday Morning Coming Down’, all chart-topping hits, helped redefine country songwriting. His talents as a musician sparked the interest of Hollywood, leading him to flourish as an award-winning actor. Heralded as an artist’s artist, the three-time Grammy winner has recorded 29 albums, including three with pals Willie Nelson, Johnny Cash and Waylon Jennings as part of the Highwaymen. In 1977, Kristofferson co-starred alongside Streisand in “A Star Is Born” which went on to win numerous awards including 5 Golden Globes for Best Actress (Streisand), Best Actor (Kristofferson), Best Film, Best Original Song and Best Original Score. Also, Streisand became the first female composer to win a best song Oscar for ‘Evergreen’ from the film. Barbra Streisand, known for her hit songs – ‘Guilty’, ‘Woman In Love’, ‘The Way We Were’, ‘No More Tears (Enough Is Enough)’, ‘Don’t Rain On My Parade’, ‘People’, ‘Evergreen’, ‘Papa Can You Hear Me?’ and many more – Streisand is the epitome of original. She is just as famous for her film career, her activism and theatre stardom. She has won 2 Oscars, 10 Grammys (including the Grammy Lifetime Achievement Award), 11 Golden Globes, 5 Emmys, 3 Peabodys, a DGA award, the Tony Award for Star of the Decade, the American Film Institute Award, the Kennedy Center Honor, the Presidential Medal of Freedom, the National Medal of Arts, and France’s Legion of Honour. She has had Number 1 albums in each of the last six decades – the greatest longevity for any solo recording artist with 11 US Number 1 albums, 6 in the UK and is simply one of the best loved and most decorated artists in any medium alive today. Now one of the world’s biggest stars will light up Hyde Park to bring the first sensational weekend to a close. Barclaycard presents British Summer Time Hyde Park 2019 is back for another year of unique shows and unforgettable music moments, for the 7th year. Headliners for Barclaycard presents British Summer Time Hyde Park 2019 are Celine Dion (5th July), Stevie Wonder (6th July), Florence and the Machine / The National (13th July) and Robbie Williams (14th July). Last year continued the tradition of must-see experiences that have previously included The Rolling Stones return to Hyde Park, Carole King play her classic album Tapestryin full for the first time ever, comebacks for The Strokes and The Libertines, Stevie Wonder playSongs in The Key Of Life and many more. 2018 saw amazing days and nights with Roger Waters, Bruno Mars, Michael Bublé, The Cure, Eric Clapton and Paul Simon’s last ever UK concert.